We’re absolutely thrilled to introduce this month’s guest contributer to you! Laurie, the talented, creative and wonderfully sweet blogger behind Vinyet Etc. is a master of all things vintage and beautiful. She has a special respect for nature, beauty in the every day and the simple things in life. 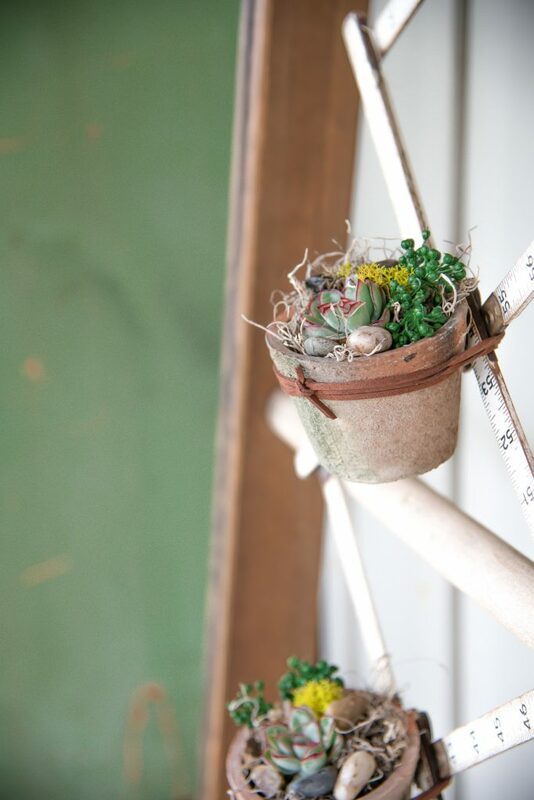 She’s spun her magic with this month’s guest post: a vintage repurposed planter idea. When, Jane and Sonja asked if I would be a contributor to their site I just couldn’t refuse, firstly I’ve met these two ladies IRL and they are as sweet and kind as you may have imagined! And secondly, their wonderful projects are inspired by all of the things I love and hold near and dear! Nature, sustainability and fun – what’s not to love about that?! Thank you so much ladies for inviting me to contribute, I sure hope you love my vintage repurpose as much as I do? AND, since many of you may not know who I am, I thought I’d do a little intro too! Hello there friends! 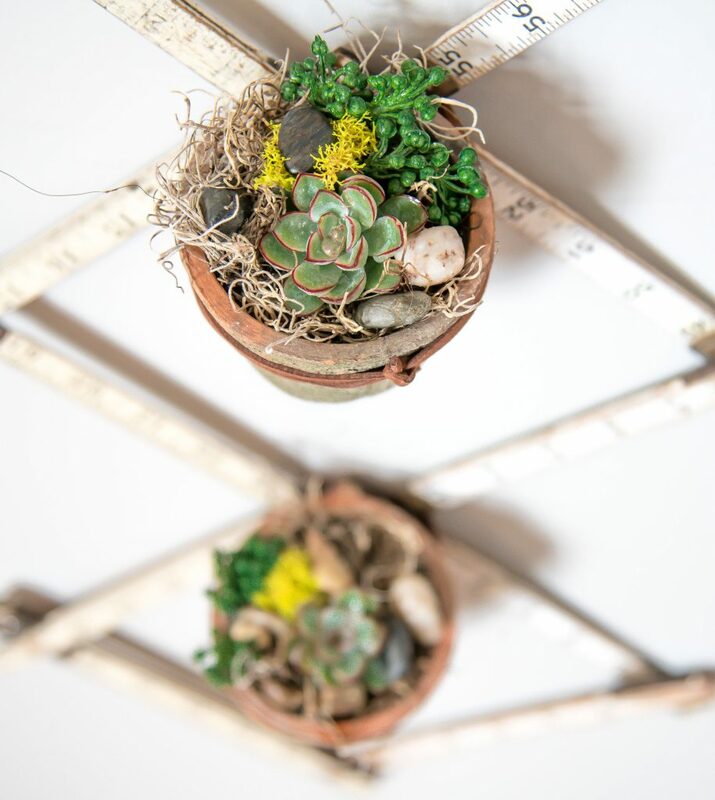 This is my first ever guest post and I’m kind of excited to share my repurposed vintage project with you: this sweet succulent planter idea. My name is Laurie, creativity and kindness feed my soul! Vintage and design is my love language and I share this amazing life journey with my best-friend, Bud. We’ve been living a creative, DIYers way of life together since 1982! You can learn more about what we do over on our website, Vinyet Etc. – and “hangout” with us on Instagram, this is where we share lots of silly laughter and fun behind the scenes shenanigans! We believe with all of our hearts that there is art in everything – if you just take the time look for it! As stated above, vintage is my thing and some vintage gets my heart pitter – pattering a bit more than others. I don’t know why, but if a certain vintage item grabs my attention, I don’t usually ask why, I just go with it. Unless of course it’s a massive Elvis bust, then I usually don’t lug that home, haha – I do have some self control! 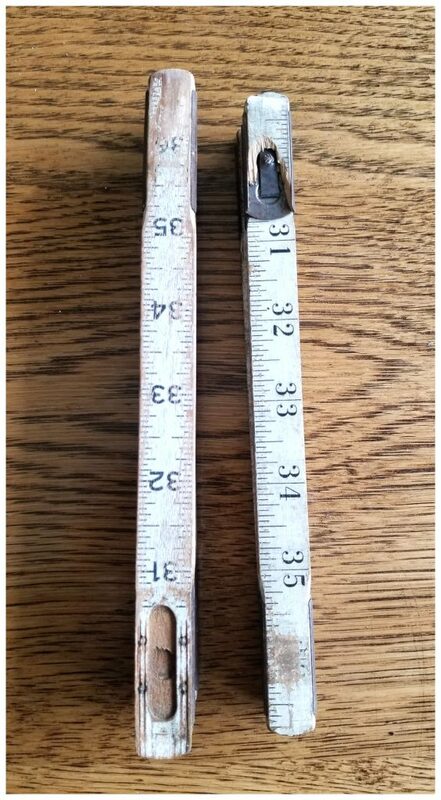 Back to talking about what I do usually lug home… ummm, vintage folding rulers. They are like kryptonite for me and I may have a few folding rulers kicking around the house. I’ve had this specific project in my head for a bit, so why not share something that is deemed as “garbage” (broken rulers) and show you that they can have a whole new life with just a little rethinking? 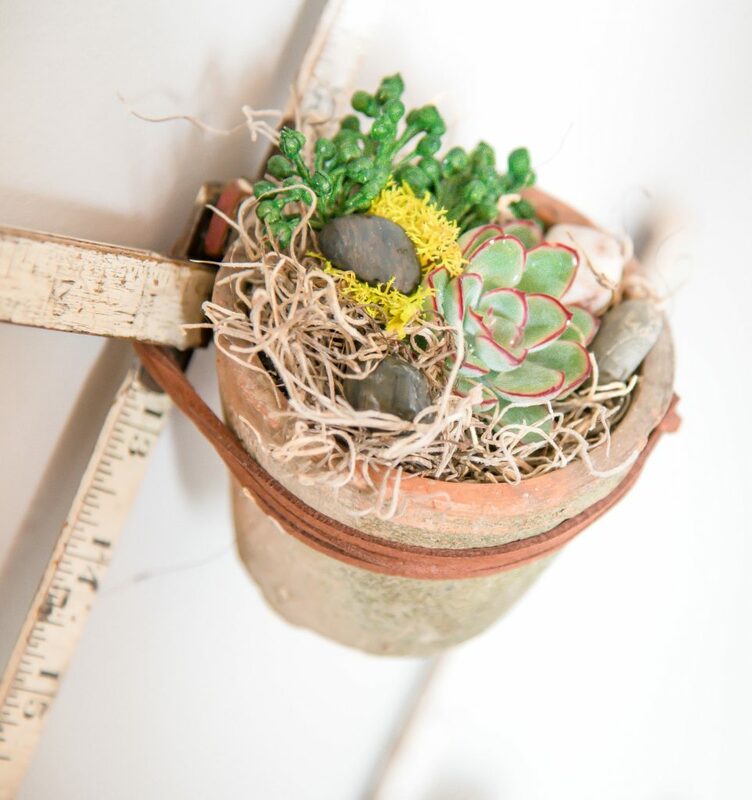 It’s no secret I adore succulents – I mean seriously, they are just too cute! 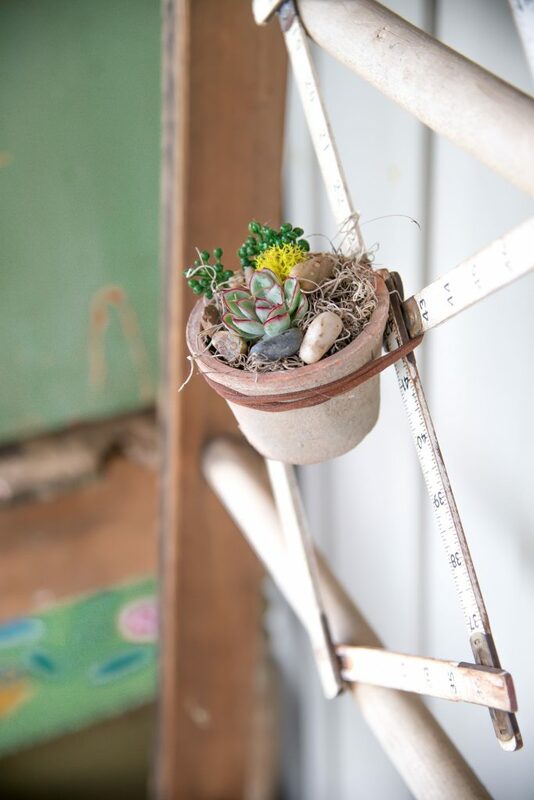 I’ve planted them in many of our vintage treasures over the years, my latest post, “planting succulents for the porch” features some of my most recent creations and a few easy care tips thrown in for good measure (see what I did there). 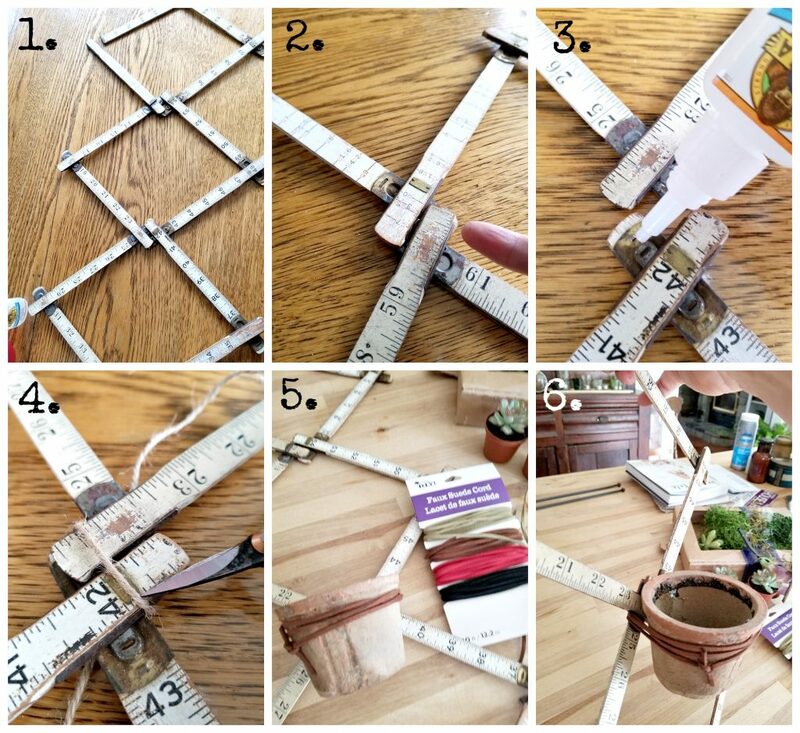 Making this, vintage folding ruler into succulent planter is so easy and this is how I went about doing it. Ziz-zag the two rulers and lay them beside each other. Dry fit them together where they bend (aka intersections). Once you are happy with your shape – a little bending is required, dab a bit of glue on each intersection. Tie jute as needed to keep intersections touching (so the glue will contact and stick) – I ended up leaving the jute tied at some of the sections as I just loved the way it looked. 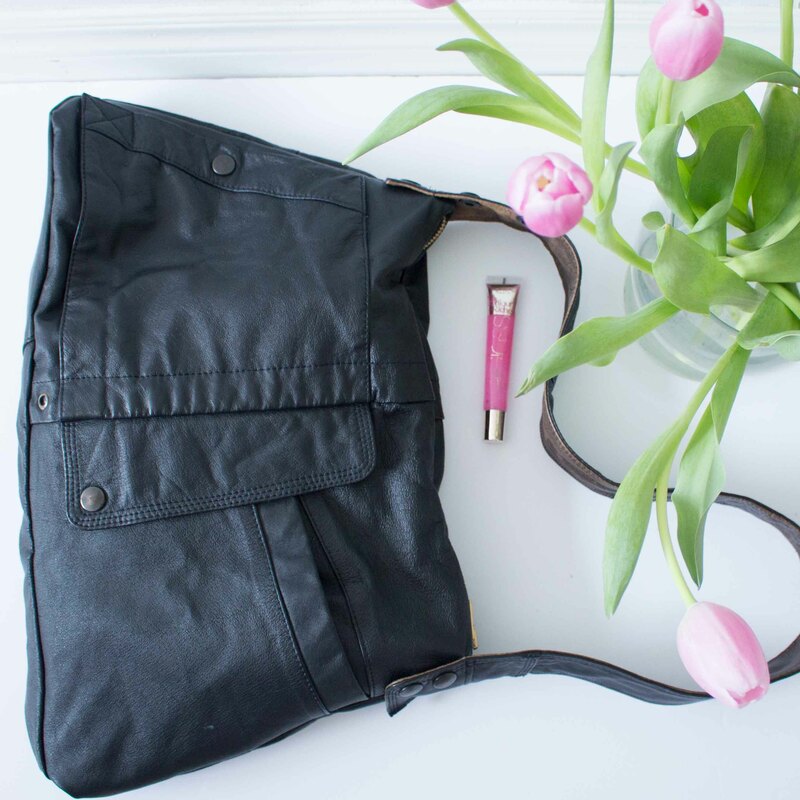 Once glue is dried, tie your clay pots to two of the intersections using the faux leather. Plant your succulents (or plants of choice) as per how you would normally in the attached pots. Hang and enjoy! 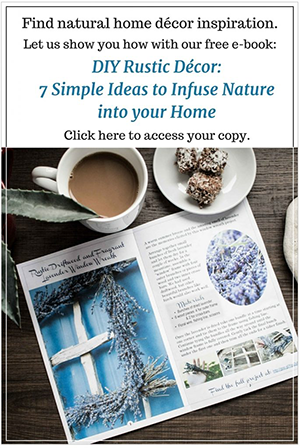 And remember this isn’t supposed to be a perfect project, if it’s a little off this will just add to the charm of the rustic pots and the vintage vibe. For more DIY planter ideas, check out this fun pineapple painted DIY succulent planter and this sweet pebble rock upcycled mason jar planter. 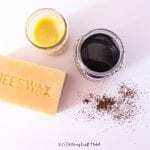 I sure hope you enjoyed this simple DIY planter idea – we love fast and easy projects here at Vinyet Etc. If you have any questions, please let us know! I’d love to see your vintage repurposed planters too – go ahead and tag me in your insta pics if you are going to build something similar! To see where I hung this adorable planter on our front porch, you’ll have to pop back over and visit this series, Outdoor Extravaganza! Thank you soooo much Laurie! 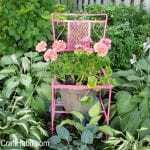 We do absolutely love your vintage upcycling idea and are so happy you agreed to share it with our readers. 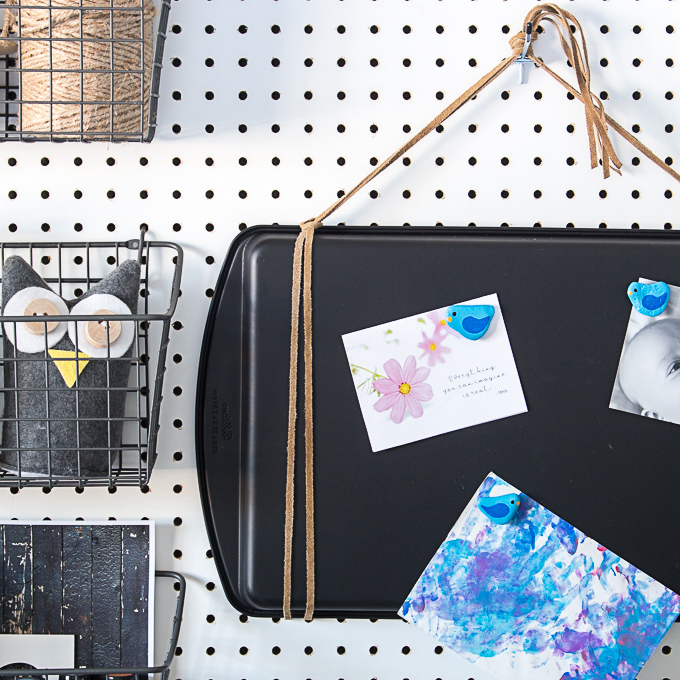 Friends, be sure to visit Laurie for more ways to repurpose everyday items. 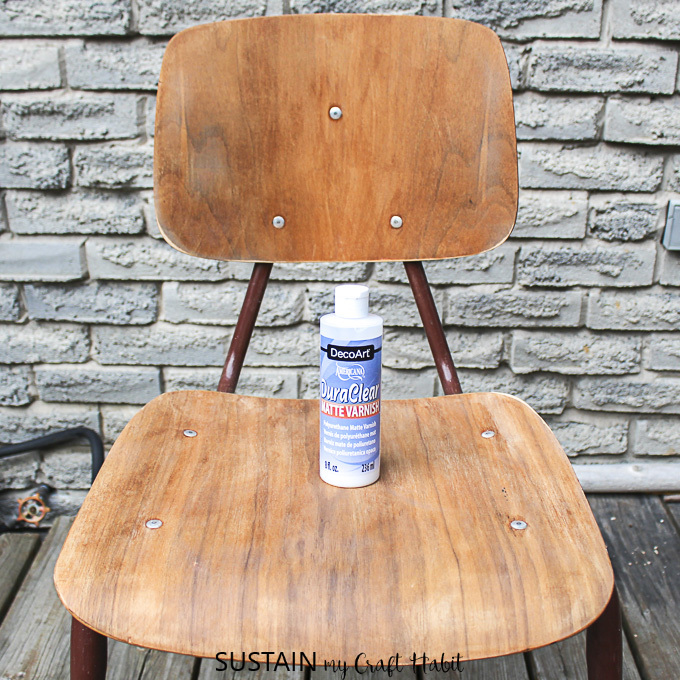 Here on Sustain My Craft Habit, you may also like how we transformed an old cookie sheet, refinished a wooden school chair, and turned a leather jacket into a useful purse.